I don't know about you, but in my recent experiences, college tours, admissions open houses, and accepted student days are starting to make me feel more like a car salesperson than a college administrator. "Excuse me, ma'am, does this education come equipped with all of the latest features or would you describe your campus as offering more of the base model?" Because I have some experience negotiating great deals in car lots throughout the Northeast, I feel better prepared for the shrewd skill of negotiations required when discussing financial aid packages with families. It appears that students today not only get to "build their luxury vehicle," colleges get to create an options package for the newest generation to come to campus, Generation Z (Gen Z), also known as IGen, a term coined by Dr. Jean Twenge, notable author, researcher, and psychologist. According to Twenge, IGen or Gen Z were "born after 1995, socialize in completely new ways, reject once sacred social taboos, and want different things from their lives and careers." What kind of different things you ask? 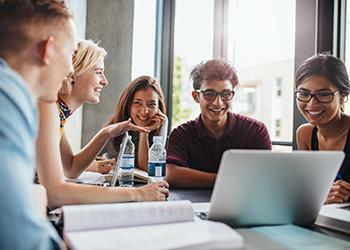 Jeff Selingo, in his recent article titled "The New Generation of Students: How Colleges Can Recruit, Teach and Serve Gen Z," says "this generation of students is interested in practical subjects with clear paths to careers." Born during the Great Recession, these students have witnessed and experienced parents losing jobs and siblings being saddled with large amounts of student loan debt and lackluster careers to show for the high debt and expensive degree. In sum, they are give me what I need (tell me why I need it), at the lowest price, in the shortest time for the largest payoff customers. Thankfully, readers, we are not selling cars, but are instead offering an education and experience that will lead to lifelong benefits for Gen Z-ers, but you'd better talk fast because if the luxury vehicle isn't going for the price of a hand-me-down mini-van, there's a fancy dealer up the street that they simply must check out before they head out of town. Because today's students are purchasing a college experience in an analytical way, let's talk options, which in the words of Selingo, translates to "customization." This generation has a need to know. They need to know the particulars, the whys, and the relevancy for not just the degree but for the course they have been advised to take, the first year experience they are required to "experience," the program that they have been invited to attend, and the litany of other choices we place before them as traditional incoming college students. Once you've finished explaining the value, to make it make sense, it must be customized: the course, experience, program, and most importantly, the degree if you plan to retain your Gen Z student. While annoying, I can't say that this is a huge surprise. How else do you hold the attention of a person who was born in the smartphone era? Their lives and their choices are customized in ways that previous generations would have never imagined. It started with "Build-a-Bear" and has now progressed to how they select an Avatar. They create and customize it, selecting traits, attire, and identities to their liking. Customization on steroids continues, as E-Gaming comes to a college near you. Student gamers buy Gaming PCs with Monitor Bundles and customized optimization packages that include such things as "Case Fans, Motherboards, Graphics Cards, Operating Systems" that they purchase, build themselves, and personalize. Days of Xbox Live and the PlayStation 4 with groups gathering over Madden or Grand Theft Auto in the student lounge are quickly fading and a new era is upon us. So what does customization look like in the classroom? I mean, some of us are still debating whether to offer a course online, forget about a degree. Before you panic, there's good news. Gen Z students are not just interested in a full tech experience, but instead, recognize the need for the social interaction, even if they don't enjoy it (remember, they are practical). Twenge and Selingo both agree that what is required are "more flexible learning opportunities including face-to-face, virtual and most of all, experiential." It will be important to connect the student's need for a customized curriculum and varying modalities of instructional delivery to the Gen Z wish to connect course content to career. There exists a need to be explicit, descriptive, and intentional about communicating Student Learning Outcomes in a manner that addresses both the learning and skill development. School and departmental activities such as curricular and content mapping might need to replace the day one icebreaker/team builder and be brought to class as "show and tell" or professors may need to add skill outcomes to the syllabus at a minimum. While we are busy creating Google office prototypes for students, might I also recommend that we think about ways that we can create space for university employees to come together and innovate. We will have Gen Z with us for just another 10-15 years and then we will see a new breed of students join our hallowed halls. We simply can't afford with Gen Z to spend all of the time it took us to research millennials, skill up with professional development, invest in expensive capital projects and create all of the "fun" programming they sought, only to implement it and see them leave three years after we finally figured it all out. Carpe Diem people, while there's still time.